Reasons Why You Should Not Vaccinate! “Vaccination is a personal decision. The debate surrounding vaccination is a rather persistent and fierce one. There are countless ongoing talks steering people into the idea that they should not vaccinate. From conspiracies by anti-vaccine activists to hate-blogs by self-entitled mothers on the internet. These kinds of irresponsible behavior brings about confusions and reluctances towards vaccination as a method of disease prevention. Personally, I appreciate those who have different opinions. Really, it is okay. However, these so-called opinions of theirs does not only affect themself, but may also harm others. Others who don’t actually understand about any of this, but fall prey under the irrational fear they got planted, after reading one invalid blog post on the net. Dear people, let’s learn to see things for what they are. Weigh out your options reasonably. Stand behind scientific evidences instead of your neighbours or fellow-moms who seem to have acquired a self-acclaimed PhD Degree on the subject. It is extremely important, in this age of Free Information to take caution upon which information is factual, and which of them are products of paranoia and agendas to push products, backed up by pseudoscience and an individual, over-exaggerated case. Yes, we too agree that vaccination is not for everybody, and should not be mandatory. IT IS A PERSONAL DECISION! Nothing in life carries no risk. Even drinking too much water in a short time may endanger you, which is why it is crucial that we do things the right and proper way. Clear, rational thinking, weighing benefits and risks, not unfounded fear or conspiracy theories are required to arrive to a responsible and plausible decision. Because if you do think about it, your own personal decision does not only affect yourself, but also others. “How?”, you may ask. In this article, we’re going to lay out the most common misconceptions and unbiased discussion on the topic. Bear with us, this is a long post, but definitely worth reading. Auto-immune diseases like Hashimoto’s Thyroiditis, Lupus / SLE, Guillain-Barré syndrome, Multiple Sclerosis, etc – weird names? I know right? Don’t worry, if these are strange names to you, then you should not have had it – means that your own body’s immune system is attacking you. Although the medical literature is full of claims and counter claims with respect to the risk of autoimmune disease as a consequence of vaccination, people with known auto-immune disorders should not vaccinate. As it may elicit the symptoms of the auto-immune diseases. Read this. Our immune system, naturally uses fail-safe mechanisms to suppress infection-associated tissue damage and thus limits autoimmune responses. Person(s) with auto-immune disorders have a malfunctioned fail-safe mechanism. This also means that any other infection (not only vaccination) may trigger auto-immune diseases. Auto-immune disorders arise in genetically predisposed individuals but require an environmental trigger. This means that if your parents – particularly mother – are known to have auto-immune disorders, there are chances that you may have it too. Before further testing, and confirmation that you do not have an auto-immune disease, any kind of vaccination is contraindicated. Better safe than sorry, right? Although newer-generation vaccines are developing into using non-live, non-whole antigen, which means that fever after vaccination is usually not expected. If you are presently ill, – with or without fever – though not an absolute contraindication, it is best to postpone vaccination. This applies to any vaccines, unless in situations where it is urgently necessary. An example for this would be, if you are about to travel to endemic areas for Meningitis, Yellow Fever, Hepatitis A, etc. Chronic diseases takes a toll on your body. During chronic infection such as Hepatitis B, your immune system is working very hard. Your immune system may go haywire, with additional burden due to some (live) vaccination. Especially if you’re on medications that further suppresses your immune system, such as chemotherapy drugs, anti-inflammatory steroids. The advise to not vaccinate also applies to anyone who is immunodeficient, with diseases such as HIV and Cancer. The only vaccine that are recommended to be given to mothers during pregnancy are Influenza and TDaP (tetanus, diphtheria, and pertussis) vaccine. And the benefit of this is primarily not for the mothers, but to increase the newborn’s resistance against the disease in the first 6 months of life. Refer to this. The thing about allergies is that each person reacts towards it differently. You may be allergic to a substance today, and develop tolerance by some time later. However, severe allergies such as anaphylaxis (acute allergic reaction that is life-threatening and can put you through shock state) that you may have experienced towards a prior dose of vaccine is an absolute contraindication for future vaccination with the same vaccine. Here we go again with the most popular hoaxtard of the century. To answer what causes the spike of Autism cases over the last decade is unfortunately not an easy task. Currently, medical professional debates over newly-found evidences are uncovering more and more understanding on this. From MTHFR gene mutations, to increases in pre-natal folate supplementation to prevent neural-tube defects, to heavy-metal exposures during pregnancy, etc. However, none of which provides for reliable conclusion. One thing is for sure though; VACCINES DOES NOT CAUSE AUTISM! (Read this) Not the mercury/thimerosal component, antigens, adjuvants, nor any other components of a vaccine causes autism. Anyone who included immunizations into account for the cause of autism – by that ignorant logic – should probably also take into account if it was sunny during the time of birth. Get it? “Natural” Is Better Than Injecting Man-Made Vaccines! Well, here’s the funny thing. Hundreds of years ago, we rely on nature to cure us. Mankind learned through trial-and-error which plants provides benefits and which are dangerous. Ever since then, our relatively young Science has contributed tremendously in advancing to search for better and safer medicines. And yet, some people are going back to a primitive mindset? Geez, no wonder the aliens have not visited us. In some cases, natural immunity — meaning actually catching a disease, getting sick, and recovering – results in a stronger immunity to the disease than a vaccination. That much is true. However, the dangers of this approach far outweigh the relative benefits. If you wanted to gain immunity to measles, for example, by contracting the disease, you would face a 1 in 500 chance of death from your symptoms and or complications such as meningoencephalitis (brain infection). In contrast, the number of people who have had severe allergic reactions from an MMR vaccine, is less than one-in-one million. All We Need Is To Eat Healthy! Nutrition Is The Key! Oh lawd! Unbelievably, there are too many of these kinds of people out there. Look here lads, we do agree that proper nutrition is very, undeniably important. That it is also crucial to human development. Proper nutrition also helps us to be fit, and protects us against diseases. However, NOT ONE SINGLE COMPONENT IS KEY! A holistic, elaborate approach towards preventive healthcare is the only undebatable logic. Among The Six Types Of People Above? 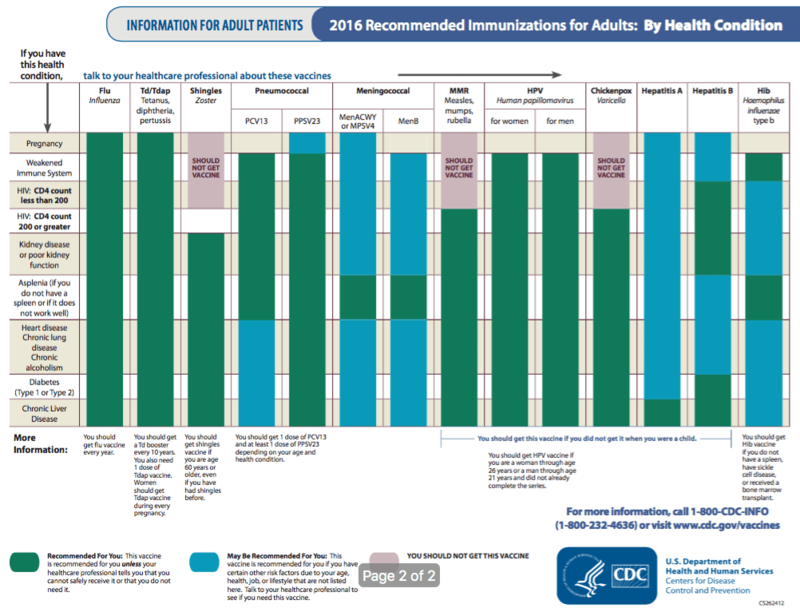 You may be among the six types of people who are advised to not vaccinate. However, you do realize the dangers of not having adequate immunity towards vaccine-preventable infections. You want to do something to prevent yourself from getting ill. You feel an urgent need to. What should you do? Pray to the almighty Lord & Savior for supernatural protection? Quarantine yourself, avoiding any outside contact for all eternity? Stockpile magical, one-cures-all, herbal potion some network-marketer offers you? Beam a light-ray to other universes, seeking help from extraterrestrial entity? Encourage others around you who do not fall under the six to vaccinate? Which one is your answer? Ours is number 5, however being the least awesome-sounding among the other choices. Vaccinations are not only a personal protection, but a communal one. Therefore, it should be a communal responsibility to do so. People who are vaccinated are not only protecting themselves, they are indirectly protecting the people in the community who are not vaccinated. Those people are our nieces and nephews, our children, who may be too young to receive their first shots. They are our parents, our siblings, our acquaintances, who may have a disease or take medication that lowers their defenses. Sure, let’s get back to the notion that Vaccination is a Personal Choice. However, the life of others are also hanging in the balance of your “Personal Choice” to not vaccinate! Still! It’s My Constitutional Right To Not Vaccinate!